I felt like this book bordered on sexual harassment and sexiness. There were times I cringed because of how dominating Damian could be. He is the complete alpha male, but sometimes I just didn’t know if he was coming on too strong or not. Janice had a lot on her plate and I thought sometimes with all the emotions coming from her situation that he could easily take advantage of her. That being said, I do think that once I started getting a better look into the world of Damian that I understood why he was trying to control so much. The topic of death and grieving was touched upon in this book. Everyone has their own way of coping and I think that’s an important thing to emphasize, especially in a romance. To me, the characters feel like real people. They have real emotion. Damian and Janice have so much more than an office romance. That’s why I really think that people should get to know them. This book doesn’t disappoint. 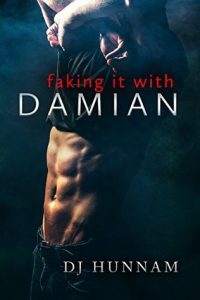 Thank you for the well-written review and for taking the time to read Faking It. I’m glad you enjoyed it! Sounds like a great read! Thank you for the great review!